Changes happen every day. Some of those changes are big and others are small. Some are good, some are bad, and others are somewhere in between. Some changes can have an effect on our estate plans and long-term medical care options. This article discusses some of the most common reasons why you may want to change your estate plan, offers some ideas for what can be done to protect your wishes, and provides guidance for helping preserve your assets. Remember that no two situations are exactly alike, so you should always speak with an experienced estate planning attorney to discuss your particular situation and the options that are best for you and your family. One of the happiest moments we can experience is when a new child or grandchild is born. It is also a perfect time to review your estate plan. Why do we create estate plans? Usually, it is to make sure that our families are provided for when we are no longer here. Many of our wills, trusts, and other documents name specific children or grandchildren who we wish to receive our property. When a new child or grandchild is born, it is important that we ensure that they will receive their rightful share and be properly provided for. This may apply to nieces, nephews, and other family members as well. When there is an addition to the family, it may be wise for you to modify your will to make sure everyone is included and treated fairly. As we all know, life will sometimes throw us curveballs. Unfortunately, we may have a family member, such as a child or grandchild, who we wish to include in our estate plans, who has an unfortunate physical or mental disability. If the family member is disabled and receiving public assistance, or may need public assistance in the future, their ability to receive that assistance can be jeopardized if they suddenly come into an additional sum of money, including money from a loved one’s estate. In a practical sense, this means that the person with a disability would need to exhaust the money that they have inherited from your estate to cover the costs of their basic needs. After that money has been spent, they would then be eligible to participate in government assistance programs again. This sounds like a terrible waste of your hard-earned money. Wouldn’t it be nicer if you could protect that money to allow the disabled person to keep receiving their public assistance and be able to use the money that you leave them for something other than their basic needs? The good news is that you can. 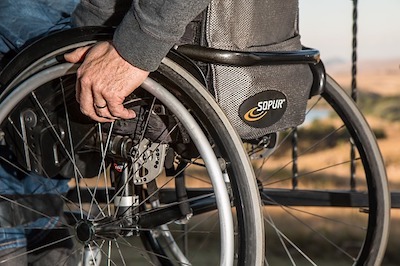 An experienced attorney can review the disabled family member’s particular circumstances and health care needs and then assess potential sources of public assistance to come up with the best plan to protect the gift that you will be leaving them. As we age, our medical needs change. As those needs become more significant, they also typically become more expensive. Many people are faced with rising medical costs and they don’t realize that they may be eligible for Medicaid or some other form of assistance to cover those costs. Whether you wish to remain living independently and have home healthcare aides provide you with assistance, or if you think a nursing home might be your best option in the future, it is important to start planning for that event as soon as possible. By engaging in certain specific planning strategies, it may be possible to preserve your assets and still qualify for Medicaid benefits which will pay some or all of your medical costs. Sometimes, despite our best efforts, a family member may suffer from some form of addiction. Many times, we do not know of the magnitude of these problems until they have become very severe. Whether it is alcoholism, drug abuse, gambling, or some other problem, many people feel that it is not wise to have that family member suddenly come into a large amount of money for fear that it will be used to support their addiction. Under such circumstances you may want to make a provision for that family member and protect the money from supporting the abusive behavior, while others may wish to cut them out completely. Whatever the case may be, if your estate plan currently includes a gift to a family member who suffers from an addiction, you should review your options to avoid enabling that addiction. How many of us know someone who isn’t good with money? They’re a wonderful person and a great parent and spouse, but they just can’t keep their finances in order. No matter how much money they have, it always runs out too quickly. Maybe it’s the new set of fishing rods. Perhaps it’s the six new purses in the closet. If this sounds like one of the people who will inherit under your current estate plan, you may want to think about changing it so that the money isn’t wasted as soon as they get it. Even though the law doesn’t allow us to force people to use our gifts for a certain purpose, there are plenty of ways, including the use of certain types of trusts, to ensure that the money we leave will be properly managed and utilized in the manner you had envisioned. We’ve all heard that the divorce rate keeps creeping higher and higher. While it is sometimes hard to pick sides when people get divorced, most of my clients clearly don’t want their former son-in-law or daughter-in-law to inherit from their estates when they pass away. If your current estate plan leaves a gift to a former or estranged child-in-law, you should consider having your estate plan modified. And what happens if your former son-in-law or daughter-in-law is the one administering the funds you wanted set aside for your grandchildren? People with a large amount of assets may leave estates that are subject to estate taxes. The exemption amount in New York state, or the level at which your estate will become subject to estate tax liability, is currently $5.25 million, and the federal exemption amount is now $11.18 million. If you are fortunate enough to have the resources above which your estate may be subject to taxation at the state or federal levels, you should explore the many options, such as various types of trusts, inter vivos gifting (gifts during your lifetime), and other strategies to minimize or eliminate your estate tax liability, so that you can maximize the resources that you pass according to your wishes. No matter what changes happen in your life, you should consider the effects they may have on your estate plan. You have worked hard for what you have, and you should make sure it gets passed on in a responsible fashion when you are no longer able to enjoy it yourself.